No doubt there are still some benighted moviegoers who think of The Blair Witch Project and Paranormal Activity as documentaries. The oft-postponed release of Apollo 18 has finally arrived and will lead to similar results. In years to come some people will claim that the moon rocks were really the eggs of space spiders and they saw this with their own eyes . . .
What might have made an interesting short story is padded into more than hour (plus closing credits) of yet another “found footage” movie. 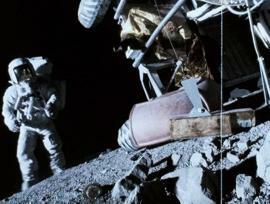 The premise is that a secret Apollo mission was launched after the official end of the project in 1972 with Apollo 17. Run by the Department of Defense, it was ostensibly to set up motion detector cameras on the moon, but the two astronauts (played by unknowns Warren Christie and Lloyd Owen) slowly discover there’s something else going on. At first it seems like it’s just the discovery of a secret Russian space mission, but soon we discover there may be alien creatures on the moon, ready to infect humanity. Of course given the rules for this kind of film, the footage is all grainy and scratchy, sometimes bad video, sometimes clearer. Savvy viewers will quickly note that even though we see one of the astronauts holding a camera in a given scene, the point of view changes during it. Are there other cameras operating? Certainly a Watergate reference suggests that the astronauts had knowledge of presidential involvement in the infamous break-in that had not yet been made public through the Senate hearings, so perhaps they’re time travelers as well! "Might have worked as a short Twilight Zone episode, but just goes on and on as a full-length movie . . ."
It’s all a lot of hokum and it’s easy enough to take cheap shots. It’s a small idea that might have worked in a twenty-two minute Twilight Zone episode, but which just goes on and on when inflated to more than three times that length. The actors – which the film does reluctantly list long after most people will have left the theater – do their best with the thin material. The effects are simple and plausible within the preposterous premise of the movie. The last few minutes of the story, when it becomes clear that the three astronauts (a third remains in the orbiter) face an inevitable fate, are taut and effective. None of this makes up for having to sit through the entire film for the final nasty twist, but give credit where it’s due. That said, let’s have an end to this misbegotten subgenre of “found footage” movies. Their original appeal to filmmakers was that they were cheap, but with most of the action taking place in Canada (standing in for the lunar surface) the estimated $5 million budget suddenly looks extravagant. Of course compared to the almost $200 million budget for Transformers: Dark of the Moon – with its similar plot of a secret alien moon base – it might seem like a bargain. Yet the fact that it’s finally being dumped on Labor Day Weekend, a traditional burial ground for abandoned movies, suggests what the distributor really thinks of its prospects. There looks to be some good science fiction movies out before year’s end. Apollo 18 is not one of them.